High yield bonds, often known as junk bonds, have been very popular investments since the financial crisis of 2008. The high yield market took a nosedive around the time of the crisis, but bounced back pretty quickly, and has been stable ever since. As interest rates have started going higher, so too have the yields on high yield bonds. For the general high yield market, yields have gone from about 5% to 6% over roughly the last year. For reference, true junk (CCC rated bonds) has a much higher yield at around 10%. On one hand, 6% is a solid yield in this day and age. For the most part, credit risk is not something you have to worry about all that much, even with so-called junk bonds. On the other hand, a lot of highly rated stuff got crushed in 2009, when almost no one had any concerns over credit risk. Of course, high yield investors don’t have to worry about credit risk if they use ETFs instead of the bonds themselves. It’s also much easier (and more affordable) to use a high yield bond ETF instead of buying individual high yield bonds. The most popular high yield ETF is iShares iBoxx High Yield Corporate Bond ETF (NYSE: HYG). It’s currently got a dividend yield of 5.1% and trades over 15 million shares a day on average. The options market is also very active, with over 130,000 options trading on an average daily basis. Speaking of options, they are a great way to generate even more income on high yield bonds or high yield ETFs. In fact, I just came across an interesting trade this week which involved writing puts on HYG. In particular, a trader sold 2,000 of the January 2019 HYG 80 puts for $1.50 with the stock at about $85.50. The put seller collected $300,000 and keeps all of it if HYG is above $80 next January. Conversely, below $80 and the trader loses $200,000 per $1 move down in the ETF. Keep in mind, HYG has only been below $80 once since 2009, and it was just there very briefly. I’d say it’s highly unlikely that the ETF gets back there in the next seven or so months prior to expiration. Furthermore, the put seller may be happy to get long HYG shares at $80 if it gets there that quickly. If you sell cash-secured puts, you get assigned on the shares if it falls below your short strike. That means you will be long the stock/ETF at the price of the strike. 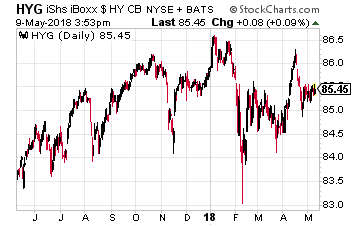 If HYG drops over $5 in 7 months (which would be highly unusual), the trader may feel that it is due for a reversal and be more than happy to own the shares. As a matter of fact, selling puts is an excellent way to get long a stock or ETF if you want to buy it at a certain price. While you wait for it to hit your price, you get to generate income on it through the short put premiums. In this case, given how slow interest rates tend to move, I believe using cash-secured puts on HYG at $80 is a smart move. At the current price, you are generating an extra 2% over a 7-month period while basically doing nothing. And if HYG does drop, you get to own the shares at a very attractive price.